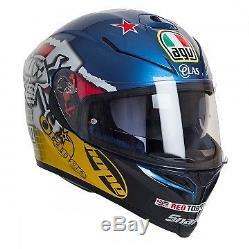 AGV K5 Guy Martin 3Some Helmet. The AGV K5 helmet is the new AGV point of reference for sports use but now with much more comfort. The AGV K5 helmet shell is made of fibreglass and carbon fibre and guarantees resistance and lightness while the lines are aerodynamic and streamlined in true AGV style. The AGV K5 motorbike helmet is a perfect fit and easily operated inner visor ensure complete rider comfort. The AGV K5 helmet features an integrated rear spoiler provides excellent stability even at high speed. Supplied with: - Breath deflector - Chin curtain - Clear Pinlock® ready visor - Clear Pinlock® insert - AGV helmet sack - Internal sun visor Type of Helmet - Full face helmet Helmet Safety Approval - EC 2205 approved - ACU gold approved Chin Strap Type - Double D ring Shell Construction.. WS36 VISOR FOR NITRO GMAC TAKACHI SYKO HELMET - CLEAR. HJC IS-Max II Dova Pink Flip Front Motorbike Helmet. Rapido e ottimo prodotto, venditore consigliato. AGV K1 Pinlock anti-fog insert lens. AGV K5 Helmet Dark Tint inner sun visor. LS2 Strobe Motorbike Helmet Visor Pinlock Anti fog Insert lens. Saleable Condition - Items must be in same condition as they were sent. This includes packaging, bags, documentation protective films etc. If this is not the case OMP Motorcycle parts may charge for repackaging or refuse the accept the return. You will be responsible for the costs of returning the goods to us unless we have delivered the item to you in error or the item is faulty. Our number one goal is to provide you with the best service for the lowest price. Mistakes and errors do occur, and we promise we will make every reasonable effort to correct the problem. Your cooperation is greatly appreciated. If this service is available on a product the service can be selected when purchasing the items. These orders will need to be placed before 12.15pm to be assured of this service, this service is available Monday to Friday only. Important Notice for all buyers outside the UK or European Union. AGV K3 Black Motorbike Helmet. AGV K3 Guy Martin Yellow Motorbike Helmet. AGV Pista GP-R Soleluna 2016 with Monster Motorbike Helmet. AGV K3-SV Matte Black Motorbike Helmet. We are one of the most established and longest serving motorcycle accessory online retailers. Originally set up to retail motorcycle helmet visors, we have over the years added helmets, helmet parts, clothing and accessories to our range. We are a full bricks and mortar business based at Duques Motorcycles which is the largest motorcycle dealership in the Channel Islands and who are official Yamaha & Suzuki UK dealers. The item "AGV K5 Guy Martin 3Some Helmet" is in sale since Tuesday, August 29, 2017. This item is in the category "Vehicle Parts & Accessories\Clothing, Helmets & Protection\Helmets & Headwear\Helmets". The seller is "omp-motorcycle-parts" and is located in Guernsey. This item can be shipped worldwide.